ELPL is excited to announce the debut of our newest section of the children’s collection: storytime kitsopens a new window! 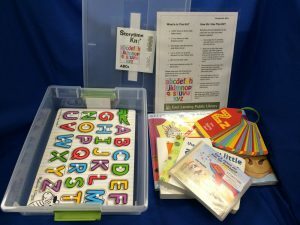 Storytime kits are just what they sound like – collections of books, music, and activities with a central theme that let you have your own mini storytime at home. With kit themes like animals, colors, ABCs, and more, you and your little readers are sure to find a fun kit to take home and enjoy. Each kit comes with several books, a music CD, an interactive toy, and a tips sheet featuring songs, rhymes, and activities caregivers can use to supplement the materials and have their very own storytime at home (or in the park, or on the go! The possibilities are endless). These tip sheets focus on the five key concepts of the Every Child Ready to Read program, which emphasizes the importance of reading, writing, talking, singing, and playing in pre-readers. Engaging in these activities through stories, music, and play – both at home and at the library – builds a foundation for life-long reading skills. Storytime kits can circulate out like all other library materials, and are checked out for 3 weeks. Don’t see a storytime kit on the shelves? They may be checked out, but you can place a hold on them as you would any other library materials so that they will be reserved for you when they are returned. Find all our storytime kits hereopens a new window! These kits are funded by a generous grant from the East Lansing Rotary Clubopens a new window – many thanks for their support!